Martin, 23, is slashing .319/.390/.470 with eight stolen bases in 11 attempts across 187 plate appearances with Double-A Midland this season. 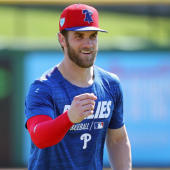 The 2015 first-round pick was delayed to begin the current campaign while recovering from offseason surgery to repair a meniscus injury, but Martin hasn't shown any signs of poor health while repeating the Texas League. Though his power production remains unimpressive and dampens his outlook in dynasty formats, Martin has been an efficient base stealer and has shown improved patience at the plate, with his 9.3 percent walk rate representing his highest mark since short-season ball. He could earn a promotion to Triple-A Nashville at some point later this season.